If you can’t say it in 60 seconds, you have a problem. Your strategy isn’t clear enough. Nowadays we call it “the elevator speech,” meaning a quick description of the business, which you could do in the time you share with a stranger in an elevator. It’s becoming popular in the everyday language of the entrepreneur, venture capitalist, and the teaching of entrepreneurship. I don’t think its academic. I think it’s important. I think it’s a great exercise that everybody in business should be able to do. Let’s get simple, let’s get focused, let’s get powerful. 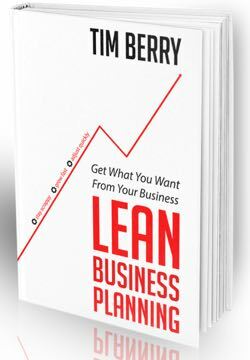 Your lean plan is simple and concise. What better way to condense it than in a quick elevator speech? If you can’t do it, worry. Terry is a successful business owner worried about social media. She knows her business should be on Twitter, Facebook, and the other major platforms, but she’s already busy running a business, and she doesn’t have time to do meaningful social media as well (Have Presence). Jane Smith wants to do her own business plan. She knows her business and what she wants to do, but needs help organizing the plan and getting the right pieces together. The plan needs to look professional because she’s promised to show it to her bank as part of the merchant account process (LivePlan). Notice that in both of these examples I could be much more general. Have Presence targets small business owners. Business Plan Software is for the do-it-yourselfer who wants good business planning. But instead of generally describing a market, I’ve made it personal. Details and granularity work. Sometimes you can get away with generalizing. “Farmers in the Willamette Valley,” for example, or “parents of gifted children.” It’s an easy way to slide into describing a market. However, I suspect you’re almost always better off starting with a more readily imaginable single person, and let that person stand for your target market. In the next part of your elevator speech, address “Why you”? Why your business? What’s special about you that makes your offering or solution interesting to the target person or organization you just identified? That was my previous post. Have Presence is a small business like Terry’s, run by three co-owners who love social media, understand small business, and do only thoughtful, strategic social media updates for clients they know and represent well. Palo Alto Software has dedicated itself to business planning for more than 20 years. Its founder is one of the best-known experts in the field. Its current management team grew up with business planning, in the trenches. The 8-person development team has more than 50 person years in the same focused area. What we focus on here is core competence and differentiation. And, in the classic elevator speech, you have to say it fast. You make your point quickly and go on. Make sure your point is the right point: benefits to the target customer. It’s not what’s great about you, but rather, what about you lends credibility to your ability to meet the need and solve the problem. I’ve included two different paragraphs for the same company on purpose. See how the unique qualifications differ for different contexts. The descriptions have to change for each. You might also think of this as the classic “What do you bring to the party?” question. It’s not just your brilliance or good looks or great track record, it’s fostering credibility for solving the problem. Have Presence gives Terry thoughtful, strategic social media updates for clients it knows and represents well. Its personnel doesn’t tell Terry what and how to do it. Instead, they do the work, manage the social media, and give her business social media presence, for a monthly fee that’s considerably less than a half-time employee, without the long-term commitment. LivePlan lets Jane jump into and out of her business plan at a moment’s notice whenever she wants. She can start with the core strategy and build it in blocks, planning while she goes, refining projections as needed. It’s built around a solid error-checked, financially and mathematically correct financial model, and a generalized set of suggestions for outlines, but is also completely flexible for adding and deleting topics and creating a unique business plan. Each task, whether topic or table, comes with easy-to-understand instructions and useful examples. In each example here we see clearly how the pitch meets the need or solves the problem. Forget features as much as possible, and illustrate benefits. You’ve already described the problem with the situation, and built up your ability to solve it, so now it’s just about the solution. Stay focused and concentrated. People will get one or at the most two unique attributes of your business offering. Don’t confuse them with more. The close depends on who you are and what you want. If you’ve personalized in the first part, sold yourself and/or your organization in the second, and established the attractiveness or suitability of the business offering in the third, it’s time to finish strong with a closing. For the venture competition or investment variety elevator speech, don’t try to convey too much information. Do establish in general terms where you are and what you want. “We’re looking for seed money of half a million dollars.” Or “We’re now raising round-two financing of three million dollars to be used for the mainstream marketing launch.” Or “We’re looking for serious marketing partners able to put money up front in return for privileged first-year pricing.” Or “We’re trying to establish a royalty relationship with an appropriate manufacturer.” And then, ask for a business card, and give one. “If you know anybody who might fit that bill, feel free to recommend us.” Or “Please give me a call.” Don’t offer to send a business plan, and don’t ask directly when it’s about investment; reduce the awkwardness by suggesting that your audience might know somebody, not that your audience might invest. Don’t talk terms in the elevator speech. Just establish what you want or need. If you’re in a real elevator with a real potential investor, you probably soft pedal: “If you know anybody who might be interested, please pass this along.” Or maybe you want a business card and permission to send a follow-up email. And if you’re doing an elevator speech in a business venture competition — close with an appropriate call for investment. Venture competitions are always keying on the hypothetical pitch to the investor, so make it clear. The better ones end up with something relatively definitive like a reference to seed capital or first-round equity investment. Stay general. Make them want more. Click here to order on Amazon.com. Click here to order the iBook (better graphic display).